Simply the best mobile medical alert system provider. As online GreatCall reviews almost unanimously claim, this company is one of the leading, most reliable manufacturers of cutting-edge wearable medical alert systems. Established in 2006 by Arlene Harris, a renowned inventor of wireless devices, it has been providing essential hardware and software solutions for more than a decade. The event that triggered the development of this company happened that same year: the introduction of their first Jitterbug phone. After that, they kept improving their system and introducing new, practical medical features. In line with that, the Urgent Care feature was started in 2009 (known as Live Nurse at the time), and then in 2011 the MedCoach app was launched. Furthermore, the GreatCall medical alert company launched the Link app in 2014, and at the end of 2015, they bought Lively Inc. At the moment, they’re part of Best Buy Co., Inc., which acquired them in August 2018 for $800 million. In our GreatCall review, we’ll introduce you to this company’s complete lineup of products, as well as their unique features, such as their excellent emergency response center. To help you weigh your options, we’ve also included a quick overview of the pros and cons of choosing this company. This medical alert system provider also offers other benefits, like, for example, its GreatCall phone plans. Let’s dive right in. Lively Mobile is, strictly speaking, GreatCall’s only proper medical alert system. It’s a wearable medical device that comes with integrated GPS technology. It’s also waterproof, but for a limited amount of time (and water): it can stay undamaged for as much as 30 minutes in a maximum of 3.3 feet of water. In the case of an emergency, the only thing you need to do is push the Urgent Response button, and you’ll immediately get in touch with one of their 5Star agents, which is also the name of their emergency response center. What also makes GreatCall Lively Mobile a highly practical device, especially for older people with more serious health issues, is its fall detection (available in the Ultimate package). Much like the AutoAlert technology present in Philip’s Lifeline models, this technology can also recognize sudden movements so that the help center is automatically notified in such a situation. Being a wearable device, people can wear it on a keychain or a wristband. It also comes with a magnetic lanyard, which makes it suitable to be worn around the neck. To activate your device you can Google “GreatCall/activate,” and you will be walked through a few easy steps. What’s more, you can also keep your Lively Mobile in the protective case and attach it to your waist belt, like one of those old-school mobile phones. 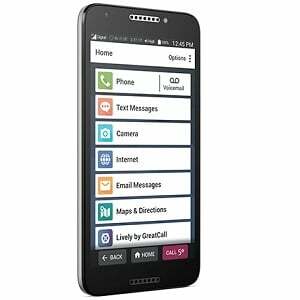 For a more in-depth look, read our detailed GreatCall Lively Mobile review. Another medical alert device from this provider, Lively Wearable is basically an Urgent Response button that can be paired with a smartphone. All you have to do is download the GreatCall Link app, and you’re all set. If you don’t feel well, press the button to establish a connection to one of the 5Star operators. When you’re put through to talk to an agent, they’ll ask you about your location and the situation you’re in to make an evaluation for their next move. Moreover, it can give your family peace, because they too can be notified if you call 5Star for help. Whether you’re near the headquarters of GreatCall in Carlsbad, CA, or anywhere else in the country, they’ll be able to locate you and send help. Just like the other Lively device—Lively Mobile—this one has the fall-detection feature. Usually, the systems that come with fall detection technology also come with high price tags, but similar to the Bay Alarm medical GPS alert system, Lively Wearable also ranks as one of the most affordable alarm systems of its kind. What also makes Lively Wearable so convenient is the fact that you don’t have to charge it. In this case, you access the GreatCall network via your smartphone. The phone and the Lively Wearable device are connected through a Bluetooth connection. That’s why you need to download their app to your phone. Needless to say, make sure that your smartphone is always properly charged. Apart from being a medical alert device, it can serve as a fitness tracker, i.e. the app can track the number of steps you make daily. One of the simplest and most affordable smartphones on the market, the GreatCall Jitterbug Smart2 covers both bases: it’s a smartphone and a medical alert device. With a 13.0-MP main camera, a 5.0-MP front camera, and 16GB of storage capacity, it’s a useful phone. It comes with the M4/T4-rating hearing aid compatibility, which is another practical advantage of this device for older people. Its navigation is straightforward and adapted to older people’s needs. All the features are arranged as a list, written in large letters and numbers. This device also comes with the GreatCall Link app, which is a useful tool to keep your family members up to date with your current condition and health. Everybody who downloads this app will get a notification in case you make a phone call to the 5Star service. Also, they’ll be receiving information on your daily activities, as well as your location. That way, they’ll stay up to date with everything happening to you during the day. You can choose from different plans to make this device suit your calling and texting needs. 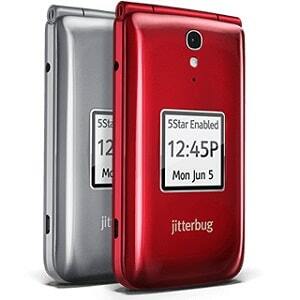 Of course, just like with any other device from this manufacturer, the Jitterbug Smart2 comes with the 5Star button for a fast connection to their agents. If you want a simple and sturdy mobile phone/medical alert device, then Jitterbug Flip is the right choice for your needs. With the 1-GB built-in storage space and a 2.0-MP camera, it works just fine as a mobile phone, while it also provides you with seamless medical supervision and fast connectivity. One of the key advantages of this traditional mobile phone are the keys on the keypad. They’re big enough for all sorts of users to be able to see the buttons and use them, even if their hands are shaking. Those with sight issues will appreciate the backlight on the keypad. Also, the GreatCall engineers made an effort to enhance the usability of this device for users with hearing problems. As a result, the improved Jitterbug speaker brings a crystal clear, loud sound. Due to its simple but sleek design—the phone’s color options are available in graphite and red—the Jitterbug Flip is suitable for various types of users. Just like any other product of this manufacturer, it has the magic 5Star button, which you need to press in case of an emergency. What Carrier Does Jitterbug Phone Use? When Jitterbug was firstly released, the only options users had were either to call “Home,” “Operator,” or 911. Although it was designed to suit the needs of elderly adults, even they like to call someone else every now and then. 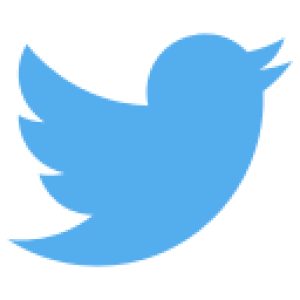 Luckily, back in 2009, GreatCall Inc. and Verizon Wireless, the most reliable wireless network operator in the country, announced their collaboration. GreatCall is a mobile virtual network operator, which means they don’t have their own network and had to include a third-party provider. That being said, if you’re wondering, “Is Great Call part of Verizon?” the answer is yes! This device comes with a built-in speaker that enables 2-way communication. In an emergency, you can speak into the microphone and hear the feedback from the agent you’re talking to. Logically, there’s a 5Star button that will quickly establish a connection with those operators. What’s great about this device is that it’s waterproof, meaning you can have a shower with your Splash. Still, every GreatCall Splash review will warn you to be careful if you go swimming with it because it wasn’t intended to be used underwater for a prolonged period of time. If you’re in need of a fully water resistant device, check out our Medical Guardian review, where we discuss some of their waterproof devices. The Splash also comes with amplified GPS technology, which makes it easier for the medical service to find you. With the more advanced packages, you get fall detection, which has turned out to be an extremely valuable feature for many users. Although no longer available on Greatcall.com, Walmart and Amazon sell Splash devices, together with some other retailers. Overall, we believe that this device is one of the most cost-effective medical alert buttons. It works anywhere as long as it is within Verizon’s network cover range. If you’re looking for a light and small device, give this one a try. 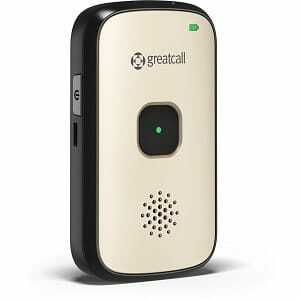 By far, GreatCall’s Lively device is our top pick for the best medical alert system. However, we were quite pleased with the other devices this company had to offer, but one thing that bugged us was the lack of additional features. For example, you can’t find wall-mounted buttons or fall detection as an upgrade. If you want your device to have fall detection technology, you’ll have to opt for a system for which fall detection is a built-in feature. The lack of wall-mounted buttons, on the other hand, doesn’t seem to be a reason for concern. 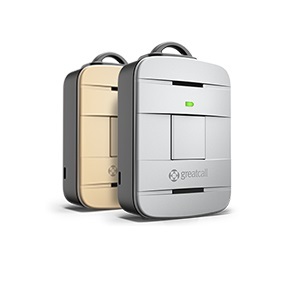 Some of the frequently asked questions is: “Is Lively Mobile waterproof?” It is, and since most GreatCall’s systems are fully waterproof mobile solutions, they eliminate the need for a wall-mounted button in the shower. Moreover, additional voice extenders are also not available, but seeing as communication is enabled through the wearable device, who needs them? Another drawback is the fact that you can’t add multiperson monitoring by buying additional medical bracelets. In fact, you have to get a whole new system. The brand also fails to deliver a lockbox, as well as fire and smoke detectors. Lively Mobile, like most mobile systems, requires a one-time activation fee of around $50. There are no annual contracts, and there’s no option to save with a longer subscription; instead, you’re billed monthly. How much is Lively Mobile? There are three different pricing plans for GreatCall Lively Mobile: Basic, Preferred, and Ultimate. As expected, the Basic package is the most affordable one priced at $24.99, and it offers 24/7 access to the 5Star urgent response center. The Preferred package comes at a price of $29.99, but in addition to the response center, it grants you access to the Urgent Care center, where you can rely on a trained nurse or board-certified doctor, 24/7. Moreover, the preferred package promises free access to the Link app, which helps caregivers track the health and safety of the monitored person. Lastly, the Ultimate package adds every additional feature available, and they will be at your disposal at the push of a GreatCall 5Star button for less than $40. It offers the same benefits as the Preferred package, but it is upgraded with automatic fall detection. In case your phone or device is lost, broken, or stolen, Great Call offers product replacement as part of this package. 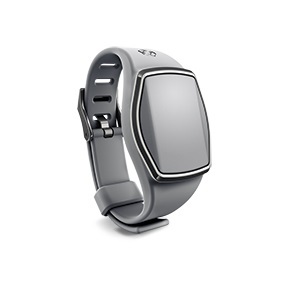 Lively Wearable comes with the same activation fee of around $50. There are no different packages to choose from, but instead, users are required to pay $14.99 per month. For this price, you’ll get access to the 5Star response center and the Great Call Link app. Similar to Lively Mobile, this device also adds fall detection. Since this Jitterbug smart phone doubles as a medical alert system, the one-time fee of around $150 is more than understandable. If you feel like this is the device for you, once again you can choose from three different packages: the Basic, Preferred, and Ultimate. The Basic plan is priced at $19.99 and allows access to the 5Star response center. In addition, it unlocks some interesting features like daily health tips, weekly wellness calls, and brain games! As part of the Basic plan, users of this Jitterbug phone will also get daily check-in calls with questions about their health and overall well-being. The price of the Preferred package is $24.99, and it comes with all the features of the Basic plan, plus access to the Urgent Care center and the Link app. As expected, the Ultimate package is the most expensive one priced at $34.99. On top of all the features of the Preferred plan, it also grants you access to a personal operator who’ll assist you with looking up addresses and phone numbers and connecting you to any number in the US or Canada. The Jitterbug Flip phone is very similar to the Jitterbug Smart2, except its one-time fee is relatively lower at $99.99. Other than the different one-time fee, the pricing structure is the same as the Jitterbug Smart2. As we’ve pointed out several times in this review, users can establish a connection with any of the numerous 5Star agents by pressing the Help button on any of these devices. When we were testing different features of these medical assistants, we also checked the response time of their operators. The average time in our experience was 15 seconds. This is astonishingly fast, especially when compared to, for example, the average time of 45 seconds we discuss in our LifeFone At Home review. What’s more, the GreatCall customer service is swift and responsive. Also, you won’t have to pay for a call to this service if you’re calling from the US. However, if the operator provides you with a certain service, the price is $0.99 a call. Another important thing that we’d like to mention here is that the agents we talked to were also able to confirm our location in less than 15 seconds. This is something users should take into account when they’re choosing a medical alert system. Sometimes every second is of the utmost importance. Last, but not least, you can choose to reach 911 directly through your device, which is another perk of their system. When it comes to customer support, you can reach them at all times, and if you are wondering what is the phone number for GreatCall, it’s 866-761-5329 (click to call and get the best deal for Lively Mobile!). What makes this medical alert service truly great is the number of options they offer, as well as the speed at which they handle their users’ requests and calls. Aside from reacting in a matter of seconds, the trained personnel is professional, friendly, and invested in helping you out. Each and every device we’ve tested is user-friendly and offers loud and clear communication. A few of their products double as cell phone and medical alert systems. You needn’t ask, What network does GreatCall use?—they use Verizon Wireless, the most reliable network provider out there! It’s also possible to set different medication reminders on most of these devices. While reviewing other companies and their output, this option was not always available. Automatic fall detection is available on most of them as well. Furthermore, when you register for your MyGreatCall account, you are provided with your personal GreatCall login information, which lets you use all the benefits of this medical alert system. Finally, the design of these products is simple but attractive, so people of different generations should be glad to use them. What we also consider an advantage over the other medical alert buttons we’ve reviewed so far is the fact that there is no cancellation fee. However, we noticed there was some confusion regarding the cancellation process while we were going through customers’ feedback. If you are struggling with questions such as “How do I cancel Great Call?” simply give them a call. One of the major drawbacks of this company is the additional activation fees. Also, some really useful and practical features are available only in the Ultimate package. While you can choose whether or not you want to use them, some affordable packages could contain at least fall detection. The large number of GreatCall reviews we’ve come across, as well as our own tests, have proven that this medical alert system company offers one of the most comprehensive services of its kind on the market. It’s fast, responsive, and innovative in its functionality and design. Due to three different service packages, everybody can find what they need and easily pay for those services. For all these reasons, it’s one of the most reliable, popular, and, much to our liking, easily accessible systems.